Monika Schmitter is a specialist in Italian art of the late-fifteenth and early-sixteenth century with an emphasis on the material culture and built environment of Venice. She is particularly interested in portraiture, patronage, domestic art and architecture, gender and class issues, and the history of collecting. She is currently completing a book on the Venetian art collector Andrea Odoni, whose famous portrait by Lorenzo Lotto depicts him surrounded by antiquities and other objects. 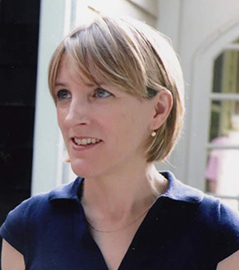 She has also published articles in journals such as Renaissance Quarterly, The Burlington Magazine, and The Journal of Architectural Historians. Her research on the sixteenth-century art expert Marcantonio Michiel has also led her to study in other cities in Italy, for example, Bergamo, Padua, and Cremona. Her publications on painted palace facades analyze monuments in Trent, Rome, Vicenza, and Siena, as well as Venice. She has been a recipient of numerous fellowships and grants, including a Visiting Senior Fellowship at the Center for Advanced Study in the Visual Arts, National Gallery (Summer 2012), Samuel H. Kress Foundation Grant, Renaissance Society of America (2011), Gladys Krieble Foundation Grant for Study in Venice and the Veneto (2011, 2004, 2000), Villa I Tatti Fellowship, Harvard University Center for Italian Renaissance Studies, Florence, Italy (2000-2001), and Lilly Teaching Fellowship, University of Massachusetts (1999-2000). Her knowledge of and affection for the city of Venice and its territories, developed over many years, informs her General Education class, “Venice: Art, History, and Environment,” which covers topics from the founding of the city in the aftermath of the fall of the Roman Empire to current controversies about tourism and climate change. She also teaches courses at the upper level in Italian Renaissance and Baroque art, as well as graduate seminars on more specialized topics. “The quadro da portego in Sixteenth-Century Venetian Art.” Renaissance Quarterly 64 (Fall 2011): 693-743. “Review of Exhibitions: ‘The Triumph of Marriage’ and ‘Art and Love in Renaissance Italy.’” With Patricia Simons. Renaissance Studies 23:5 (November 2009): 703-12. "Odoni's Façade: The House as Portrait in Renaissance Venice," Journal of the Society of Architectural Historians 66 (Sept. 2007): 294-315. "Virtuous riches: The Bricolage of Cittadini Identities in early sixteenth-century Venice,” Renaissance Quarterly 57 (2004): pp. 908-69. “The Dating of Marcantonio Michiel’s ‘Notizia’ on Works of Art in Padua,” The Burlington Magazine 145 (August 2003): pp. 564-71. “Falling Through the Cracks: The Fate of Painted Palace Façades in Sixteenth-Century Italy.” In The Built Surface. Architecture and the Pictorial Arts from Antiquity to the Enlightenment, Volume 1, edited by Christy Anderson. London: Ashgate, 2002, pp. 130-161. “The Display of Distinction: Art Collecting and Social Status in Early Sixteenth-Century Venice,” PhD Dissertation. Ann Arbor: UMI, 1997. Venice. Practitioners and Patrons: Collaboration in the Graphic Arts. With Annette Dixon. Exh. cat. University of Michigan Museum of Art, Sept. 1996 - January 1997.